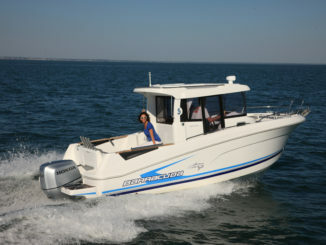 Daily tide charts are generally stated in relationship to the “mean” (average) low tide. When the outgoing water dips below this point, you get a negative low. Mid-fall-winter sees the year’s lowest tides, particularly on the strong gravitational pull of a new or full moon; but throw in the hard north wind of an approaching cold front and you can expect the sea to drain shallow flats that stood 3- to 4-feet deep just hours before. Why does this matter? Here’s the baseline: Tides rise and fall daily with predictable levels of access and activity based largely on a fish’s feeding ability. Higher water lets them come and go as they please, but low tides are nature’s traffic cops. Declining water level drains shallow grass flats and pushes predators into channels, cuts and troughs where they tarry ’til the tide’s return. Now, take this balanced process and overweight the low tide end to the point of resembling a drained swimming pool and that’s what negative lows are all about. 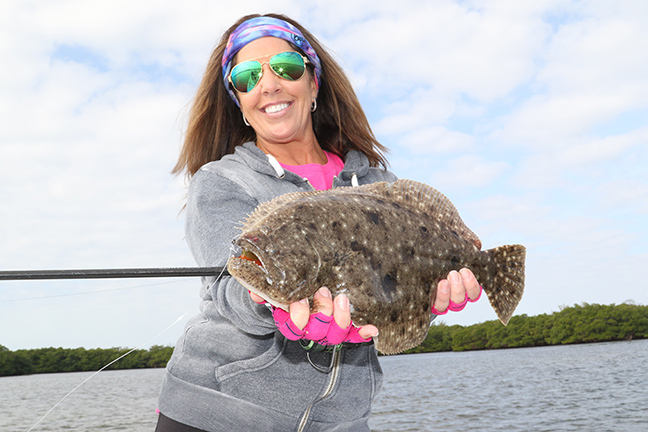 Exaggerate and extend the fish’s inability to move throughout their shallow range and just watch the magic happen. By “magic,” we don’t mean waving wands and mystical incantations; this stimulus for negative low tide amazement is a lot more straightforward — fish gotta eat. When snook, redfish, trout; flounder, bluefish, jack crevalle and ladyfish find themselves trapped in depressions with sufficiently sustainable depths, but no access to deeper open water, they tend to gobble up all the forage they can find. The tidal isolation typically lasts longer than the food supply, so fish typically respond aggressively to baits tossed into their low-water detention center. Natural baits like shrimp, pinfish and sardines will produce, but artificials are more effective for probing tidal depressions and finding concentrations of fish. 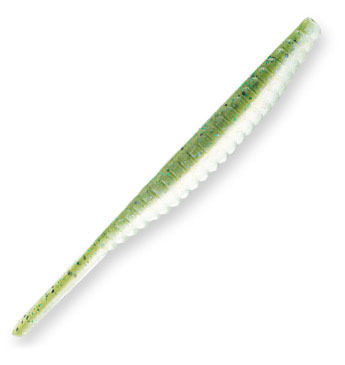 Topwater walking baits are a seasonal favorite because the aggression level or trapped fish ensures some of the most vicious strikes you’ll ever see — especially if you locate a bunch of big speckled trout. Lead head jigs offer great diversity for working the entire water column and quickly switching between soft plastic jerkbaits, shad tails and curly tails. Z-Man’s ElaZtech Trout Trick, Slim SwimZ and GrubZ remain three slick softies, elite offerings on a 1/8- or ¼-ounce jighead. And don’t overlook artificial shrimp, like LIVETARGET’s Rigged Shrimp. Free-lined or fished under a popping cork for a noisy suspended presentation, these crustacean impostors appeal to a broad range of species — and they don’t require aeration. 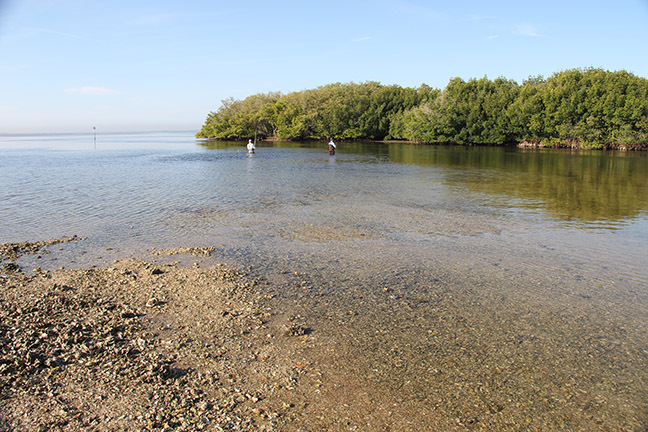 Getting There: Negative low tide fishing is ideal for kayakers; whether you’re a paddler, or one who prefers the hands-free approach of a pedal-driven model like Old Town’s Predator PDL. 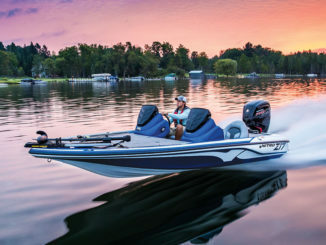 Virtually limitless in their accessibility, kayaks blend boundless reach with the low-profile stealth that allows you to sneak into fishing range undetected. Wading’s another option with a solid aerobic upside. Even a slow stroll through knee-deep water creates enough resistance to burn those calories, but pick up the pace and you’ll find a thigh-searing workout en route to your target zone. Weather: Calm, clear conditions make it easier to spot the edges of sand holes, while cloud cover and wind may challenge your visibility and casting accuracy. Also note that strong winds often accompany fall-winter cold fronts and this can become a limiting factor for the kayak option. hing grounds. If winter brings bitter cold, consider a Thermonet Balaclava. You’ll also appreciate the protection, fish-gripping surface and fingertip exposed design of the BUFF Pro Series Angler 2 gloves. Keep a grip on that rod, while preventing sun exposure and painful pokes from fish spines. Lastly, consider BUFF’s UV Arm Sleeves. Often, warmer fall weather brings chilly mornings that yield to balmier conditions. Here, it’s handy to be able to peel off that lower arm covering without actually changing shirts. Conversely, on days that find you in short-sleeve shirts, keeping these breathable polyester sleeves rolled up in your pants pocket or in your Plano tackle bag means instant access to that extra comfort should the sun’s rays grow too intense. Edges — Where flats or island edges drop into a channel or trough, predators can corral baitfish and other forage like a cornerback pinning a receiver against the sideline. Holes — Smaller microcosms of the larger tidal depression concept, a smaller “pothole” might be a tiny 6-foot by 6-foot cavity or something more like a family-size swimming pool. In any case, the inherent depth change of a foot or more gives predators a strategic spot in which to lay and ambush baitfish and crustaceans moving across the edge. Remember to work that entire hole, not just the middle. A lot of time, your fish will be sitting right on that edge where the grass rolls off into the sand. Working a bait across this boundary is always a good move. 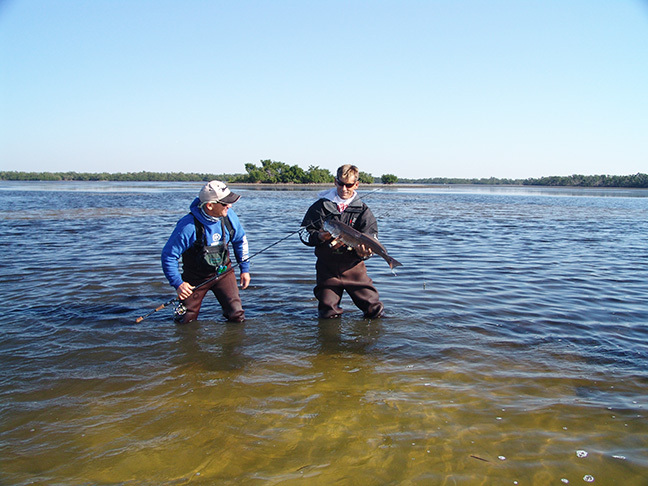 Mullet Schools — Moving in large schools, these chunky vegetarians have no interest in the crabs, shrimp and baitfish they displace; however, opportunistic snook, redfish and trout are wise to the free meals. 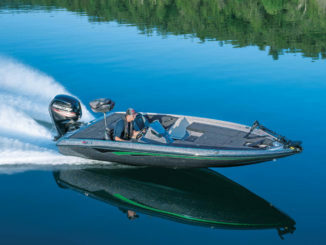 Spotting a big group of mullet milling about, splashing and leaping often means predators in tow. Birds — Whether it’s glass minnows, pilchards or threadfin herring, sea gulls and terns will spot a school of baitfish well before you see it. Predatory fish will also seek out this food source, so when shrieking birds hover close to the surface, consider it a “cast here” sign. Know your tide schedule. Knowing where and when to find safe boating depths is critical for planning your route and avoiding lengthy groundings. On the flipside, that waist-level trough through which you gracefully passed on low tide might be near the top of your waders when the water returns. If you kayak into the area and then hop out to wade, be sure to securely anchor or stake out before walking to your fishing spot. Simply beaching the yak on a mud bank won’t cut it when the incoming tide starts creeping upward to eventually float your boat. 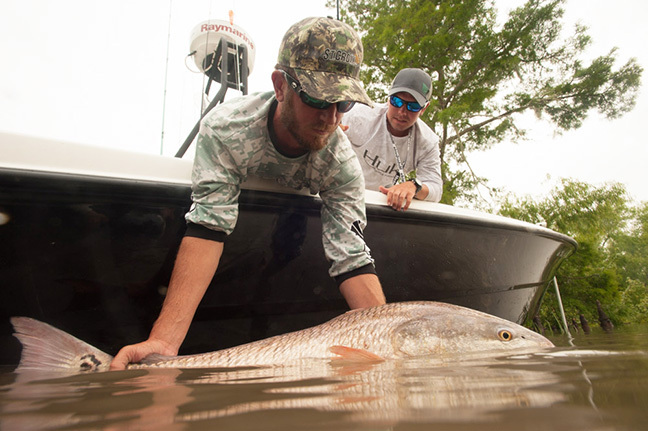 Mild years may find southern waters tolerable for wading in shorts or lightweight fishing pants, but, at some point, you’re going to need insulated waders for fishing on foot. When selecting your style, consider a stocking foot style with a separate wading boat slipped over the waders. Soft muddy bottoms tend to grip footwear and when boot foot waders get stuck, you risk a potentially tragic tumble in chilly waters.